In case of damage of one winding the power can be transmitted through the two units by using an open delta connection, so 50% power can be transferred. These transformers use less space. These transformers are lighter, smaller, and cheaper. These transformers are slightly more efficient. If the single winding of the transformer gets damaged, then we have to change the complete unit. For connecting the transformers into star or delta, we have to assume that the transformers we are connecting, are all of the same KVA ratings. What are the factors that affect the choice of connections? We have to check the availability of a neutral connection for grounding, protection or load current. Insulation to ground and voltage stress. We have to check that the path for the flow of third harmonic and zero sequence current is available or not. When one circuit is out of service, we need the partial capacity. Parallel operation with other transformers. We have to check the economic considerations. In delta-delta connection the line voltage of the transformer is equal to the supply voltage of the transformer. The above diagram shows the delta-delta connection of three windings of single phase transformer. 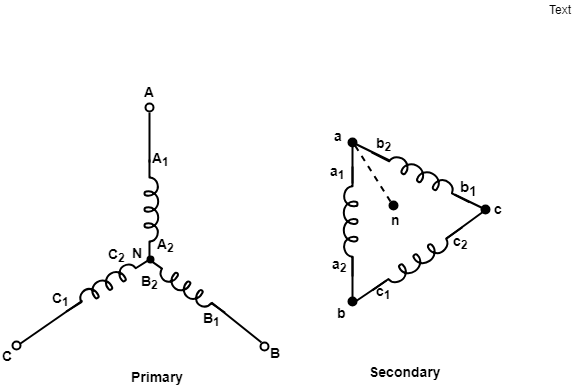 The secondary winding a1 a2 corresponds to the primary winding A1A2, b1b2 corresponds to B1B2, and c1c2 corresponds to C1C2, similarly 'a' corresponds to A, 'b' corresponds to B and 'c' corresponds to C. The terminals 'a1' and A1 have the same polarity. The Phasor diagram drawn above is for lagging power factor cos Φ. For balanced conditions, the line current is three times the Phase current. 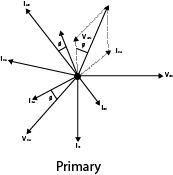 We can see from the above-drawn diagram that both the primary and secondary line voltages are in phase. This connection is called 0° - connection. 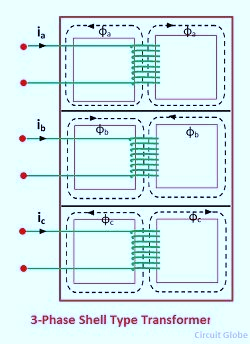 If we reverse the connections of the phase winding, we obtain the phase difference of 180° between the primary and secondary systems. This connection is called 180° - connection. The delta-delta connection is good for balanced and unbalanced loading. If a third harmonic is present, it circulates in the closed path and therefore does not appear in the output voltage wave. The main advantage of ∆ - ∆ transformer is that if one transformer stops working, then the other two transformers will keep on working. This is called an open delta connection. The disadvantage of ∆ - ∆ transformer is that it does not contain a neutral point and this can only be used when neither primary nor secondary requires neutral, and the required voltage is low and moderate. 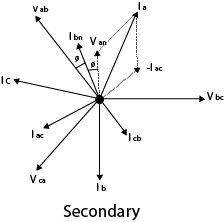 In the star-star connection when the load is unbalanced and neutral is not provided, then the phase voltage tends to become severely unbalanced. 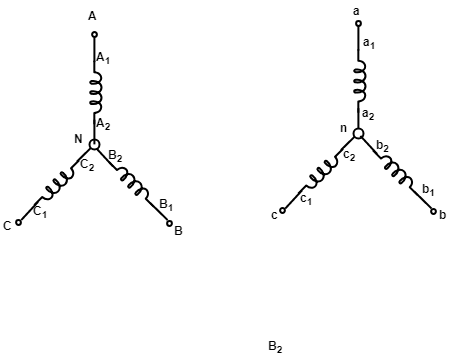 Therefore, the star-star connection is not suitable for unbalanced loading. The magnetizing current of any transformer is very non-sinusoidal and contains a very large third harmonic, which is necessary to overcome saturation to produce a sinusoidal flux. 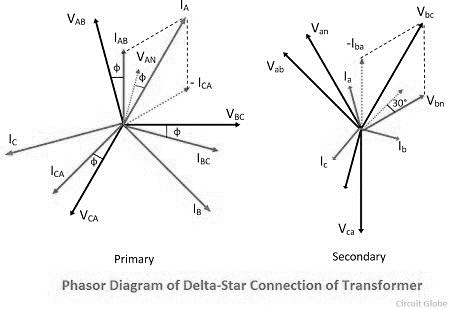 The phasor diagram drawn above shows the delta-star connection supplying a balanced load at power factor cos Φ lagging. It is seen from the phasor diagram that the secondary phase voltage Van leads primary phase voltage VAN by 30◦. Similarly, Vbn leads VBN by 30◦ and Vcn leads VCN by 30◦. This is also the phase relationship between the respective line-to-line voltages. This connection is called +30◦ connection. When there is a phase shift of 30◦ lead between respective line-to-line voltages then this type of connection is called as +30◦ connection. And when there is a phase shift of 30◦ lag between the line-to-line voltages then the connection is known as -30◦ connection. The ∆ - Y connection or Y - ∆ connection has no problem with unbalanced loads and third harmonics.